Create selfies that get plenty of likes with the slim, stylish COOLPIX S6900. This camera is built for self portraits. Its Vari-angle LCD flips all the way around to face you; a built-in kickstand keeps the camera in an ideal selfie position. 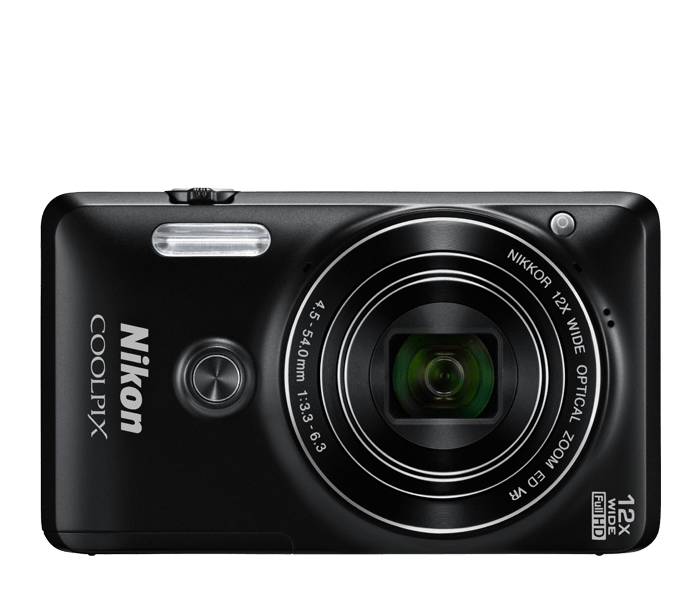 When you're ready to take a shot, you can use the convenient front shutter button or you can just wave your hand—the COOLPIX S6900 includes Nikon's cool Gesture Control feature! Then share exceptional images directly to your compatible smartphone or tablet using the camera’s built-in Wi-Fi® and Near Field Communication technology (NFC)**. To take a great selfie, you need to be able to see yourself. That's why the COOLPIX S6900 has a Vari-angle display that faces all the way forward, and a built-in kickstand. Set it up on a table or shelf, take a step back and frame your selfie. When you like what you see, press the convenient front shutter button and capture the shot. If you can't reach the shutter button, you can use hand gestures to capture a photo or start recording video! Every COOLPIX is designed around a genuine NIKKOR glass lens, the legendary optics that have helped make Nikon famous. The COOLPIX S6900’s 12x optical zoom lens goes from wide-angle—great for portraits and landscapes—all the way up to telephoto—great for closeups of sports, concerts, nature and more. When you need even more reach, zoom up to 12x with optical zoom and 24x with Dynamic Fine Zoom, an enhanced digital zoom function that effectively doubles your reach. Quickly and easily send photos wirelessly from your Wi-Fi & NFC enabled COOLPIX S6900 to a compatible smartphone or tablet± using the Wireless Mobile Utility app. Share your great photos on the go, even in remote locations, or use a smartphone or tablet to control your camera. It's frustrating when a smartphone camera focuses on the wrong thing. With COOLPIX S6900, Target Finding AF instantly and accurately determines your intended subject and focuses on it—not on just whatever is closest to the camera. Catch the shot you want on the first try. No more out of focus shots or the frustration of trying to get the camera to focus on the right thing. Experienced photographers optimize their camera settings to match the situation. The COOLPIX S6900 does that work for you. With 19 Scene Modes, including Beach, Snow, Night Portrait, Sunset and more, it's easy to match the moment to a Scene Mode. You can even get creative and use Scene Modes to alter ordinary shots. Or, select Scene Auto Selector and let the camera choose the best mode for your situation. If you want a compact camera that shoots stunning Full HD videos, the COOLPIX S6900 delivers. Full HD 1080p means exceptional video quality. Record the action, then connect to an HDTV* and watch your videos come alive. A built-in mic records high-quality audio in stereo. Your videos will look and sound phenomenal. When you're too far away to press the shutter button, simply hold up your hand in a "Stop" position. The COOLPIX S6900 will recognize your palm and activate Gesture Control. Move your hand toward the top left of the frame and the COOLPIX S6900 will start a photo countdown; move it toward the top right, and the COOLPIX S6900 will begin recording Full HD video. Why settle for one expression when you have so many? With the COOLPIX S6900's Self Collage feature, you can combine up to nine separate photos into one cool collage image. Use the COOLPIX S6900 just like a photo booth—set the interval between shots (short, medium, long) and the total number of photos (four or nine) and then have fun!